Today we honor those who made the ultimate sacrifice for our freedom. Did you know today wasn't always called Memorial Day? Memorial Day was originally called Decoration Day. To honor the deceased, soldiers would decorate graves of their fallen comrades with flowers, flags and wreaths. Hence Decoration Day. Although Memorial Day became its official title in the 1880s, the holiday wouldn't legally become Memorial Day until 1967. Decoration Day is still honored separately as a day of mourning soldiers and visiting family gravesites in several states in the South. Congress and President Lyndon Johnson declared Waterloo, N.Y., the 'birthplace' of Memorial Day. There, a ceremony on May 5, 1866, honored local veterans who had fought in the Civil War. Businesses closed and residents flew flags at half-staff. Supporters of Waterloo's claim say earlier observances in other places were either informal, not community-wide or one-time events. There no veterans left alive from the the Spanish-American War, which was fought in 1898, but there are 43 spouses still alive and receiving veterans benefits. There were 385 battle deaths in that war. Between the beginning of the Revolutionary War in 1775 and the First Gulf War, which ended in 1991, a total of 651,031 soldiers were killed in combat. The most U.S. service members killed in battle during a war was during World War II, with 291,557 battle deaths and 113,842 others who died in service during the war. One of the conflicts with some of the fewest U.S. service members killed in battle include the First Sumatran expedition in 1832, in which the U.S. Navy attacked the village of Kuala Batee in Indonesia in response to the massacre of the crew of the merchantman Friendship a year earlier. Two U.S. sailors were killed. Arlington National Cemetery was founded in 1864 during the Civil War when 200 acres of Confederate Gen. Robert E. Lee's Arlington plantation were set aside as a cemetery. The intent was to render the house uninhabitable should the Lee family ever attempt to return. The first soldier laid to rest there was Pvt. William Christman, 21, of the 67th Pennsylvania Infantry, who was buried in a plot on Arlington's northeast corner on May 13, 1864. The Tomb of the Unknown Soldier, laid to rest in Arlington Cemetery, is guarded meticulously. Each soldier guarding the Tomb marches 21 steps down the black mat behind the Tomb, turns, faces east for 21 seconds, turns and faces north for 21 seconds, then takes 21 steps down the mat and repeats the process. After the turn, the sentinel executes a sharp 'shoulder-arms' movement to place the weapon on the shoulder closest to the visitors to signify that the sentinel stands between the Tomb and any possible threat. Twenty-one was chosen because it symbolizes the highest military honor that can be bestowed -- the 21-gun salute. The idea of Vietnam Veterans Memorial was spearheaded by wounded Vietnam War vet Jan Scruggs, using $2,800 of his own money to form the Vietnam Veterans Memorial Fund in 1979. The U.S. Congress set aside land for the Washington D.C.-based memorial, but the V-shaped wall was built without government funds. All donations came from the private sector. Bob Hope and other celebrities lent a hand with fundraising, and by 1981 some 275,000 Americans, along with corporations, foundations, veterans groups, civic organizations and labor unions, had given $8.4 million to the project. 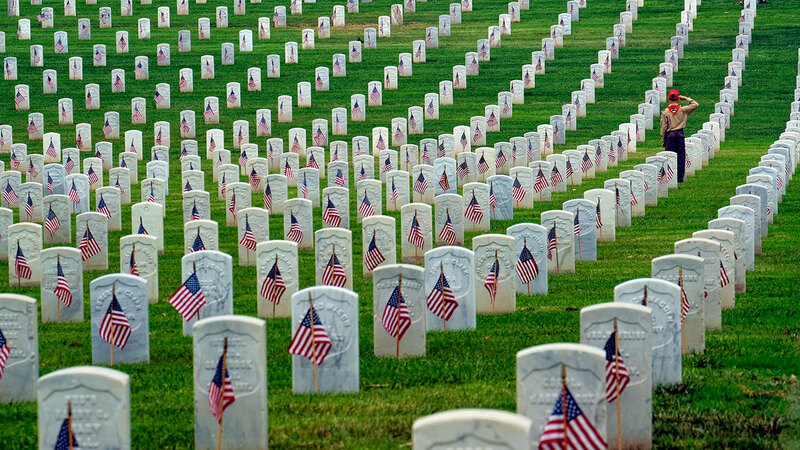 More than 218,000 Americans are buried or memorialized oversees. Many of America's war dead are buried in American military cemeteries located in Europe: France has 11 American cemeteries, the most of any other country. Belgium has three, the United Kingdom and Italy, two, Luxembourg and the Netherlands, one. There are U.S. military cemeteries outside of Europe, too. The oldest military cemetery located outside the U.S is the Mexico City National Cemetery. It dates from 1847 and is the burial site of nearly 750 unidentified American soldiers killed in the Mexican-American War, and later from the U.S. Civil War and Spanish-American War. There are others in Panama, Manila, and in Tunisia.